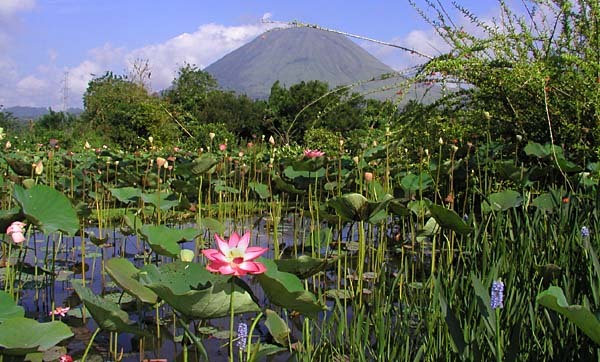 Gardenia Country Inn -- Located in the small village of Tomohon, called the City of Flowers, the 45-minute drive from Manado to the Gardenia Inn takes you from the heat and humidity of sea level to an altitude of 900 meters (2950 feet), and a completely different environment. The air is pleasantly cooler and drier in the highlands, and a different set of flora and fauna become evident. 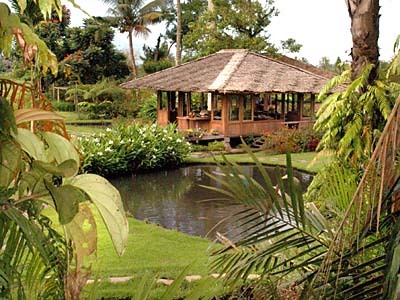 Lush Gardens beside a Buddhist Temple -- Set well back from the road beside an intriguing multi-tiered Buddhist temple, Gardenia Country Inn is artfully sited amidst manicured gardens, a rushing mountain stream and lively koi ponds. There are multiple dining areas, each with its own unique charm. A selection of outdoor and semi-open nooks, platforms and small grottos are perfect for serious relaxing, reading, walking, bird and butterfly watching, and private meditation. Services Offered -- Available services include massage, day tours, and an excellent restaurant that specializes in a remarkable BBQ dinner that one cooks to taste on a gas burner built into your table. 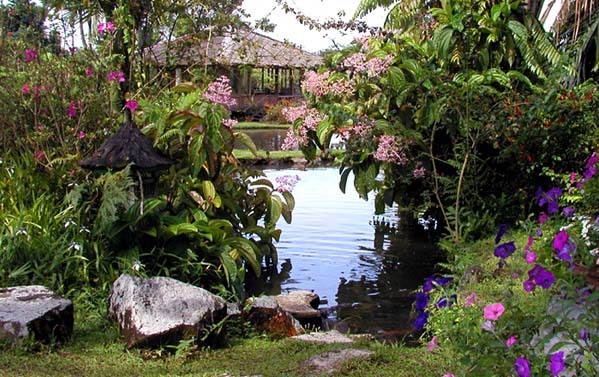 Breakfasts are served from a beautiful open air dining room surrounded by fish ponds and flowering plants, and overlooking a majestic volcano. If all the natural beauty and contemplation is too much for you, the bungalow rooms also include a TV set, VCR, and a selection of contemporary movies are available. Complimentary Wi-Fi connection to the Internet is also available. A Romantic and Relaxing Getaway -- Gardenia Country Inn is a perfect spot for a romantic get away, a place to banish the symptoms of jetlag after the long international flights, or better yet both at once. It can be combined with any visit to Manado, including Kungkungan Bay Resort, Lembeh Resort, Gangga Island Resort & Spa, and/or Siladen Resort & Spa. We recommend it highly to anyone with a taste for massage, meditation, or just in need of a rejuvenating respite from the "real world." Getting to Gardenia - International flights connect from Los Angeles to Singapore or Bali. From there fly Silk Air or Garuda Airlines to Manado. From Manado International Airport, the transfer is less than 45-minutes by car to peace and beauty of Gardenia Country Inn. Contact Island Dreams for discount airfares and complete information. Package Pricing - Your Gardenia Inn package includes airport greeting and round-trip transfers, welcome drink and traditional snack, lodging based on your choice of room styles and occupancy, hotel tax, breakfast, lunch and dinner daily, plus afternoon tea. Gardenia Inn now also offers complimentary Wi-Fi Internet connection. The following prices are per person in U.S. dollars, based on double (twin share), or single, occupancy. Double occ. Single occ. Double occ. Single occ. Optional massage and tour guide services are available at additional expense. Please note that all prices and package inclusions are subject to change. Gardenia Country Inn Photo Gallery by Karen Jacobs - The following photographs are provided courtesy of Karen Jacobs. Gardenia Inn Photo Gallery. Copyright Karen Jacobs. Photographed on the grounds of Gardenia Country Inn. All rights reserved. Island Dreams will create a custom Indonesia itinerary offering you maximum diving value, plus the option of rewarding topside touring to Manado, Bali, Komodo, and beyond. A wide variety of diving and touring options can be customized to suit your taste, budget, and time constraints. Contact the adventure experts at Island Dreams for complete details. Start planning YOUR ultimate dive adventure...contact Island Dreams today! Island Dreams owner Ken Knezick has made numerous, extended research trips to Indonesia. Read his most recent review of diving opportunities in North Sulawesi, Indonesia, with first-hand reports from Murex Dive Resort and the excellent new Lembeh Resort. Copyright © 1995-2019, Island Dreams, Inc., dba Island Dreams Travel. All photos, text and design elements on this website are copyrighted. All rights reserved. Please note that all pricing, airfares, itineraries, descriptions, and trip inclusions represented on this site are subject to change without notice.